This is a copy of the famous Albrect Dürer Haus in Nürnberg. 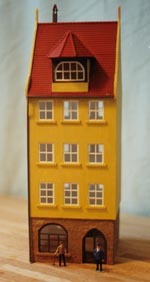 The model is based on a commercially available cardboard model and on pictures taken of the house during a visit to Nürnberg. 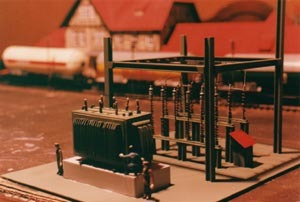 This transformer station is based on the Pola model in HO. To create all the insulators, I used lots of sequins and putty. 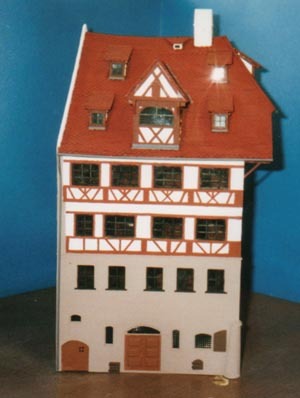 This house is also from Nürnberg and the plastering method using bathtub caulking became the basis for an article in O Gauge Railroading Magazine.